Live commentary on BBC Radio 5 live sports extra, BBC Radio Manchester and BBC Radio Leeds; score updates on BBC Sport website. 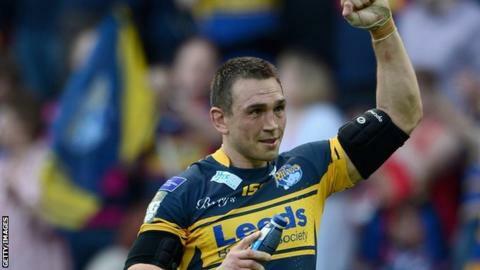 Leeds Rhinos skipper Kevin Sinfield says his side will be able to play without fear in their play-off semi-final against Wigan. The Rhinos finished 10 points and four places behind the Warriors in the regular season. Sinfield told BBC Radio Leeds: "The pressure is off us and we go there knowing we have got nothing to lose. "They were justifiably the league leaders, they've had an extra week off and we're without Danny McGuire." Sinfield continued: "We'll go there and throw everything at them because we don't want to die wondering. "We'll have to find our best performance of the year. If everyone of our 17 does that then we'll have a chance." Leeds will be missing half-back McGuire after he was given a one-match ban by the RFL for a reckless high tackle in the win over Catalan Dragons. Sinfield, 31, led the Headingley side to victory in last year's Grand Final after finishing fifth in the regular season, the same place they ended the 2012 campaign. The England international believes his team thrive in the autumn conditions. "This time of the year has always been special around this place," he continued. "There's a chill in the air and it's wet and horrible outside but for us it's a great time of the year. "We've had another rollercoaster year and we don't want it to end on Friday."